Fuga da realidade em Dry Creek Cabin! Venha país experiência de vida no seu melhor! Cabin Dry Creek está localizado em Tuscumbia, Missouri, no final de uma tranquila estrada de cascalho, instalou-se no fundo de um vale deslumbrante. Um, escape encantadora isolada de dores de cabeça modernos, sem internet ou cabo de interferir. Nossa cabana rústica 1000 sq. Ft. É embalado com amenidades modernas. Ele tem todos os confortos de casa e, em seguida, alguns! Então venha para fugir, relaxar, e deixar todas as preocupações de uma vida agitada derreter. Uma vez que você está rejuvenescido e quiser explorar um pouco, a cidade de Eldon fica à direita da estrada e Lake of the Ozarks é apenas uma curta de 20 minutos de carro de distância. Com uma variedade infinita de restaurantes, atividades, entretenimento e compras, você tem certeza de encontrar algo divertido! As reservas de pagamento solicitado datas. O pagamento pode ser reembolsado se os proprietários são notificados um mínimo de 14 dias antes da chegada. Todos os reembolsos, será cobrada uma taxa de serviço de $ 25. Cancelamento dentro de 14 dias de datas reservadas perde metade do pagamento. Não chegada em datas indicadas perde pagamento inteiro. Check-in no Dry Creek Cabin será após 15:00 no dia da chegada. Confira será antes do meio-dia no dia da partida. Não fumar e não são permitidos animais. A ocupação máxima de seis pessoas; quatro adultos e duas crianças, ou dois adultos e quatro crianças. Deve ser pelo menos 21 anos de idade, ou casado, para fazer uma reserva. Os proprietários de Dry Creek Cabin reservamos o direito de remover qualquer inquilinos não cumpridores da propriedade a qualquer momento, por sua discrição. Cada reserva será cobrada uma taxa de limpeza de US $ 50, e um depósito de danos de US $ 125 (o equivalente a uma noite de estadia). O depósito de danos será devolvido na íntegra 7 dias após o check out, pendente nenhum dano for encontrado. Questões relacionadas com qualquer política listados acima devem ser enviados para os proprietários com antecedência da reserva. Nós oferecemos uma taxa de desconto para estadias semanais. Entre em contato com proprietário para obter detalhes adicionais. My wife and I were amazed with the cabin. The pictures do not do it justice! 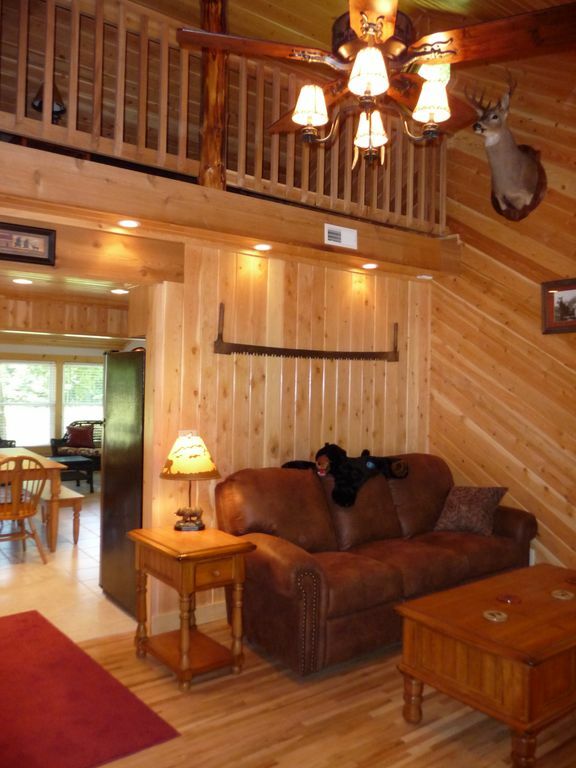 The cabin has everything you could want. We enjoyed playing the board games and sitting by the fire. Tom and Dori were very nice and helpful with questions we had about town! A perfect getaway! We will be back! You were such a delight to visit with! We feel blessed that you found us! We hope you can come enjoy our secluded getaway again sometime soon!! The cabin was beautiful, very comfortable. We enjoyed the peace and quiet. It was relaxing and the best place to get away from everything. Enjoyed the chance to disconnect from all the electronics. We enjoyed meeting Tom & Dori and appreciate their hospitality. Would recommend anyone to contact them for a stay in paradise. So glad you were able to relax and recharge!!! It was a delight to meet you!! Perfect getaway ! The disconnect was exactly what we needed. If you are looking for a beautiful , isolated,peaceful spot that will share the ability to disconnect from everything except the loved ones around you - this is it . Dori and Tom were absolutely amazing hosts !! Thank you both for sharing the ability for others to completely relax , find peace and a connect with the beauty of nature . So many small details that made this an amazing and rememberable trip. My soul needed to disconnect in order to reconnect after the passing of our son . Thank you for this ! We are thrilled you chose Dry Creek Cabin to soothe you in your grieving journey. You are an amazing family, and we appreciate all you have accomplished and are continuing to do to help others because of your precious son Lucas. May God continue to bless your ministry in the years ahead! The cabin was perfect for our family vacation. We had everything we needed, and I mean everything we needed to enjoy our weekend. The cabin and area is very well maintained, the amenities helped to ensure we enjoyed ourselves - firewood for fire pit, BBQ grill, reading room, trail, etc. Thank you for a memorable experience! We are thrilled you enjoyed your stay and family time! What great downtime before school starts. We hope you can visit again!! My husband and I stayed at Dori and Tom's cabin on Dry Creek road for two nights in July. It is a beautiful property and we were really happy with everything. There is only one negative and I only mention it because I want anyone who might arrive on motorcycles to realize what I somehow managed to miss - to get to this cabin you have to travel for over a mile on gravel roads. We were traveling on our can am spyders so the roads weren't a huge problem, but back in my two wheel days, this would have been a show stopper. if you are coming in a car, you will have no problems at all. Also, when you make your reservation, Tom will email you directions. Read them carefully and follow them. I let my garmin lead the way and it took us down around 3 miles of scary gravel roads. That being said, the cabin and property were breathtaking. Dori has such attention to detail and didn't leave out anything. There is a washer and dryer in the cabin along with soap and dryer sheets and even a laundry basket! The kitchen is well appointed with beautiful stoneware dishes, fully stocked with cooking utensils, spices and a dishwasher (God bless you Dori and Tom!!) This is where the attention to detail really impressed me. The cutlery matched the towels, which matched the rugs, which matched the décor perfectly. There is a grill and a fire pit out back, a hiking trail and lawn chairs. There are three different sitting areas in the cabin. We called one the 'surprise room' because it is located off the bathroom in the master bedroom. Most people would have made it a walk in closet, but Dori and Tom created a beautiful sitting room with comfortable chairs and end tables. We were delighted! The cabin is far enough back in the woods that we didn't hear any traffic noise at all, which was perfectly awesome. There is a cow pasture in back with a herd of black angus that were curious enough to come to the fence to watch us but kept their distance. Make sure to read the guest book on the end table. Past guests have started a hide the dollar bill and hide the coin game, leaving clues as to the location of both. It was a lot of fun to read the clue, find the items and then hide them and leave our own clues. Reading past guests' entries, it was obvious that people really got into this game and put thought into their hiding places, a lot of which were quite clever! Thank you for the awesome review. It was our pleasure to meet you and share our escape with you!!! 1-2 Adults: $125/night plus tax, two night minimum stay. $12 for each extra adult, maximum four adults. Children 8 and under are free. Maximum occupancy is four adults and two children, or two adults and four children. Sleeping accomodations include one queen bed, one double bed, and one sleeper couch. $700/week plus tax special rates. Must be at least 21 or married to reserve.